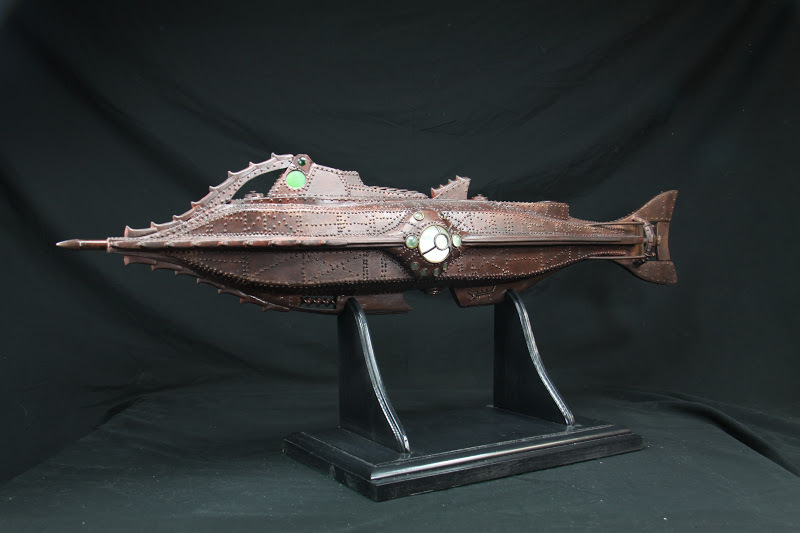 The Nautilus, Captain Nemo’s Submarine from 20,000 Leagues Under the Sea was scratch built from various materials. At 38 inches long, glass port windows, and with over 5,000 hand laid rivets this build was a large undertaking! The first thing I did was find blueprints online and had them blown up and printed out. I used them as templates to work from, and also affixed them to plywood I used to build the frame of the ship. I started with a X & Y axis of the Ship (Outline of the ship looking top down and Outline of the Ship looking at it from the side) That gave me an exoskeleton to work on. The next thing I did was build up the body of the ship with foam. I used pink Insulation foam from Home-depot. I cut it down and filled the four spaces between the axis of the Ship. I then sanded the foam down until I got the shape and curves down of the ships hull. Then I literally slopped on the Bond-o and sanded that down. The Bond-o gave the body of the ship some strength. I then skinned out the body of the hull in plasti-card (I used for sale signs from Walmart, much cheaper that way) I filled the gaps in the plasti-card with Aves Fixit Sculpt, and sanded that down till it was nice and smooth. Once I had the body of the ship done I spray painted it flat white to get everything uniform. With the Ships Body done what came next was adding all the details. Working from images and a rivet Blueprint for the Nautilus (again, found online) I marked out on the hull of the ship where all the rivets would go. I used craft/scrapbooking rivets, the smallest ones I could find from Michael’s Craft store, in various different colors. (I bought out 3 local Michael’s stores in the Twin Cities) I then drilled holes and affixed each rivet by hand. It was a painstaking part of the project, but really adds to the complexity of the ships design. The rest of the details were added as follows: Sculpted and Cast Ridges (approx. 37 in total), Sculpted and Cast 2 Side Galley sections, Glass windows (marbles for the smaller windows and magnifying lens for larger), Rotating prop, pivoting ruder, and a nose cone built from model missile and piece of brass tubing! I then painted the ship flat black and went over it once more for anything that needed to be reworked, and when everything looked great, I put its first coat of paint on. I started with a Rustoleum Hammered Copper Spray Paint. I did this to get the hammered metal effect on the ship, giving it a little more of a texture. I then did some copper air brushing, getting into all the nooks and cranny of the ship. Then I did 3 various washes that I mixed up myself. Mostly consisting of a metallic paint, mixed with browns and blacks to get the final look. I then clear coated it all in a Satin Finish. I also built a basic, black display base for the ship to sit in. I think it came out extremely well. I am happy with it, and I know the owner is happy as well! If I could go back and do it again (and had more time) I would have loved to add lights to the windows on the Nautilus! Check out Pack Rat Studios for many more pictures of the Nautilus and of course, his custom action figures!